For cherry vanilla jam, combine ingredients in a saucepan and stir over medium-high heat until sugar dissolves. Bring to the boil and cook, stirring occasionally, until mixture reaches setting point (6-8 minutes; see note), refrigerate until well chilled (1-2 hours). Meanwhile, for almond pastry, process almonds in a food processor to form coarse crumbs (1 minute). Beat butter and sugar in an electric mixer until creamy, scrape down sides of bowl, add flour and almonds, beat to just combine. Form into a disc, wrap in plastic wrap and refrigerate for 1 hour to rest. Butter a 20x28cm rectangular tart pan. Roll out pastry on a lightly floured surface to 3mm thick and line the prepared pan, trim edges, prick with a fork and freeze until firm (30 minutes). Preheat oven to 180°C/350°F. Line the pastry with a large piece of foil and fill it with baking weights or dried beans. Bake until light golden (10-12 minutes), remove paper and weights/beans, bake until golden and crisp (6-8 minutes), cool completely. Whisk crème fraîche, cream and icing sugar in a bowl until firm peaks form (2-3 minutes), refrigerate until required. Spread jam in base of pastry case, spoon over crème fraîche mixture, top with fresh cherries, dust with icing sugar and serve. Note: to test for a jam’s setting point, place several saucers in the freezer before you start cooking the jam. When the mixture becomes thick, remove from heat, spoon a little onto a chilled saucer and return to freezer for 30 seconds. When you draw your finger through the mixture it should hold a trail. If it doesn’t, cook for 1-2 minutes longer and test again. Mmmm, these look really yummy! I love the combination of cherries and almonds! You've chosen a fabulous taste combination. And your photo looks like something out of Donna Hay! 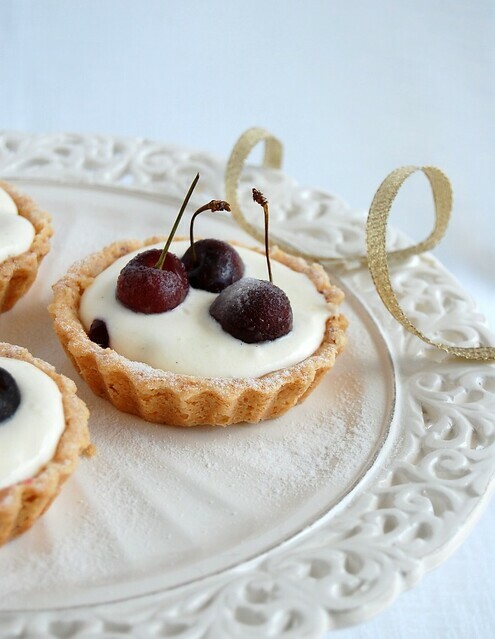 Soo cute and adorable tartlets..
your crust is perfect, Patricia! these look yummy and anything with a cherry on top, gets my vote! This looks really scrumptious and yet simple. I'm looking for more recipes like this. I think yours looks better then the gourmet one! 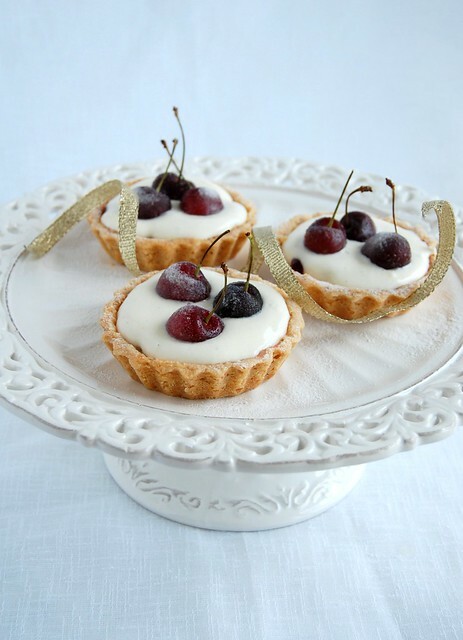 what pretty tarts and beautiful photographs! I love it!